CFILC's roots are anchored in a connection to our peers, since 1976 ILC Executives have prioritized the need to easily connect with our colleagues to foster collaboration and innovation. CFILC produces three statewide meetings per year for members only, who function as our Board of Directors. At least one meeting is held in Sacramento, annually, with the remaining meetings are held in northern and southern California. Our meetings include presentations from funders, foundations, and government agencies. 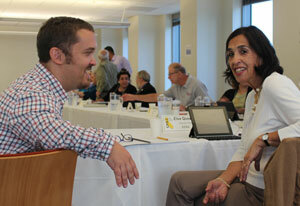 ILC Executives share expertise, best practices and resources. It is at our statewide meetings that we develop our Public Policy Agenda and actions plan for systems and social change. CFILC moderates a series of communication listservs for ILC Executives, Management and Staff so that they may access and share information and expertise quickly and throughout the state. ILCs regularly share resources, materials and "know how," which fosters collaboration and innovation. Since 1978, CFILC members have been meeting to determine how best to provide critical services, and advocate for freedom, choice and equality. Building strong and sustainable Independent Living Centers is one way we have proven our strength. CFILC is developing an extensive library of resources to build and sustain strong Independent Living Centers. From ILC Job Descriptions, to Employee Policies, to Cost Allocation Plans, and Fund Development Plan, there is no reason for an ILC Executive to have to start from scratch. CFILC members receive a Fund Development bulletin developed by GrantStation exclusively for Independent Living Centers in California. The bulletin highlights upcoming funding opportunities from government sources, foundations and corporations. The bulletin is provided every other month and covers national, regional and local funding options. CFILC staff work with Independent Living Centers across many types of programs, and regularly provide trainings as a part of our programs. We understand ILC programs and funder expectations. CFILC staff are available to work with CFILC Members to develop specialized trainings for ILC staff and board members around Independent Living Philosophy, Disability History, Diversity, Multi-cultural Outreach, Disability Pride and Culture, Youth Leadership Development and more. CFILC Membership dues support the work of a Public Policy Director dedicated to issues that impact Independent Living Centers and the community we serve. CFILC works with our members to identify issues, develop strategies, and implement action plans that lead to systems change across four main methods: administrative advocacy, regulatory advocacy, legal advocacy, and legislative advocacy. Building and sustaining strong ILCs requires a great deal of planning, documenting and innovating as the landscape of opportunities is constantly changing. Whether you are looking for a fund development expert, insurance agent, information technology company, or board training consultant, CFILC members enjoy discounted rates from consultants and contractors that have been recommended by ILCs around the state. YO! works to Connect, Educate and Organize youth with disabilities through volunteerism at CFILC Member ILCs. CFILC members agree to provide work- space and onsite supervision to a youth with a disability aged of 16-28. CFILC agrees to provide a monthly stipend directly to your YO! Volunteer for one year, for a minimum of 16 hours of volunteer service per month. Volunteers participate in community change and education campaigns, outreach, and local ILC programs, events and activities. GrantStation.com, Inc. (GrantStation) offers nonprofit organizations, educational institutions, and government agencies the opportunity to identify potential funding sources for their programs or projects as well as resources to mentor these organizations through the grantseeking process. Employers Group members receive exclusive benefits and privileges - whether it's for one or one thousand employees at your company. From day-to-day operations to strategic long-range planning, and everything in between, Employers Group is dedicated to the success of your entire organization. By joining CalNonprofits, you're part of a leadership network of nonprofits advocating for nonprofits and our communities and to the public at large. Through our lobbyist and policy director in Sacramento, our legislative updates, we work to bring the full power of nonprofits to strengthening communities. Get Started on Becoming a Member of CFILC. Click to get started or call CFILC at 916-325-1690 / 916-325-1695 TTY.